011a – Blade Runner (Part One) | All Eighties Movies. All The Time! This week we begin our two part podcast on the amazing film that is 1982’s Blade Runner. One of the seminal works in film and science fiction in particular, this one is AngryMan’s birthday choice. So head to the future (well, 2019) and have a look at a film that as Gidgit says – ”Made today it could be done shot for shot. It just hasn’t dated” And that’s hard to argue with. Awesome – love it. Seen this movie in every version. Wish you did directors cut but understand why you didnt. Awesome movie. Nice podcast. 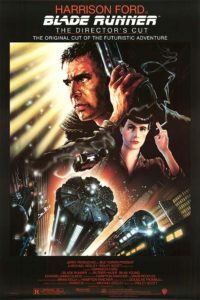 Awesome Blade Runner Podcast (Part One). BR is one of my favourite sci-fi films (up there with Alien Trilogy, Star Wars Saga) so it was great to listen to your thoughts and gain some new perspectives. Harrison Ford was in a lot of movies at this time, fun to learn he cut his hair so he didn’t have to wear another hat! I always thought Daryl H styling in this film was unique-great to learn she came up with it herself! Yes it was an amazing film considering its future insights into technology, yet made in 1982! Multiple versions of BR, with one clocking in at four hours! The set design & costumes in BR work just as well in 2016- with its eclectic mish mash of styles & use of technology. I never noticed before that one of the stated replicants was missing! I never thought that Fords character may be a replicant himself! Wow! Thanks for a highly entertaining Blade Runner PC Gidgit and Angry Man- I’m looking forward to part 2. Part 1 PC went by in a flash! PS: There is an online store where those super cool umbrellas with the neon light are available for purchase. What was the name again? Something geek? !